As you’ll see in this 2018 Volkswagen Atlas review from the team at Oklahoma City Volkswagen, this SUV has plenty to offer drivers around the Norman and Edmond areas. With powerful engine options, a versatile interior, and standard safety technologies, it’s no wonder this is such a popular vehicle for drivers in the greater Oklahoma City area. To learn more about the 2018 Volkswagen Atlas, check out our review, then contact us to schedule a test drive. Let’s start our review of the 2018 Volkswagen Atlas with the interior. This 3-row SUV seats seven passengers comfortably. The second and third rows have 37.6 and 33.7 inches of legroom, respectively. The second-row seats are also large enough to accommodate three children’s car seats. This interior is versatile, with the option to fold down the rear rows to open up a total cargo area of 96.8 cubic feet. An available Hands-free Easy Open power liftgate helps you conveniently load up this space. If your hands are full, simply kick under the rear bumper and the liftgate will open automatically. 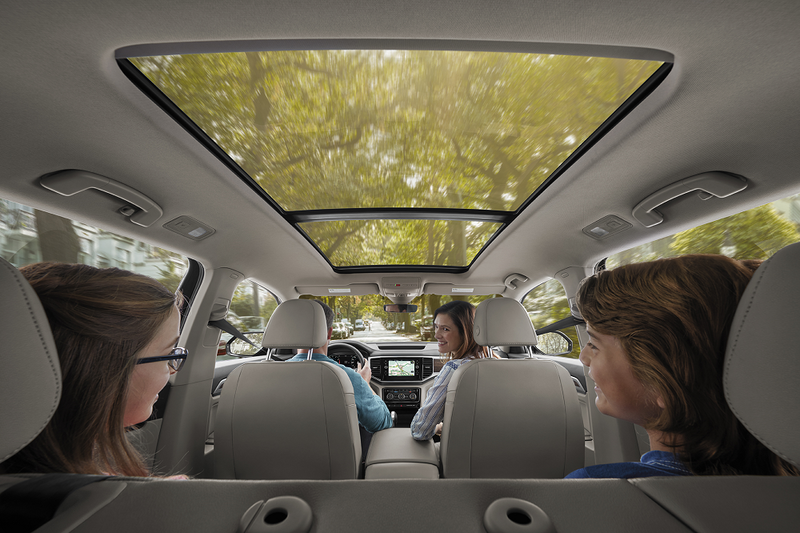 To bring in an abundance of fresh air and sunlight, we recommend the available panoramic sunroof. This pane stretches the entirety of the cabin and can make the interior feel even more spacious. Whether you’re chauffeuring your family or heading out on a solo trip, you’ll want to be sure to reach your destination safely. 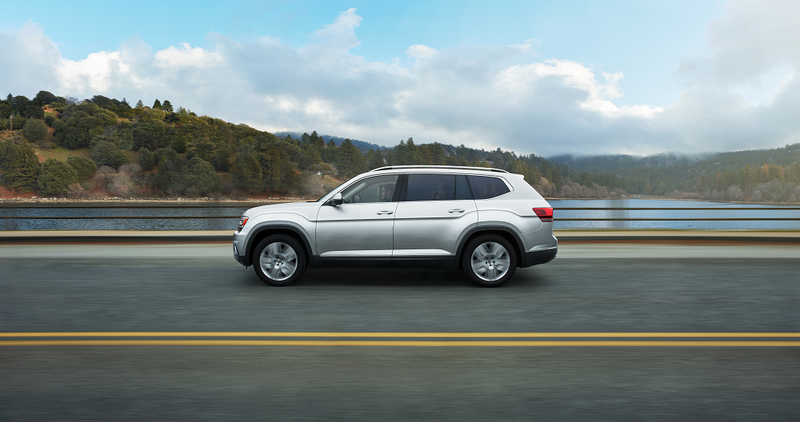 The Volkswagen Atlas is on the same page here and has several available smart safety technologies that are designed to help you be more aware of your surroundings. Blind Spot Monitor and Rear Traffic Alert, for example, provide an audible warning if another vehicle enters your side or rear blind spots. The Front Assist system is also helpful for city driving. This includes features like Forward Collision Warning, Autonomous Emergency Braking, and Pedestrian Monitoring. These systems work together to alert you to potential hazards up ahead—including other vehicles and pedestrians—and can automatically hit the brakes if necessary, to try to help you avoid an impending collision. The 2018 Volkswagen Atlas gives you a choice between two powertrains. The standard engine is a 2.0L TSI® I4 that generates 235 horsepower and 258 lb-ft of torque. This is great for everyday driving and is paired with a front-wheel drivetrain. If you want even more power, you can choose the available 3.6L V6 engine that delivers 276 horsepower and 266 lb-ft of torque. This comes with the 4MOTION® all-wheel drive (AWD) system with Active Control. This drivetrain allows you to choose between four different drive modes to optimize handling and performance. Both engines have an 8-speed automatic transmission and a Start-Stop System. The Start-Stop System helps prevent unnecessary fuel use by powering down your engine while idling at stop signs or traffic lights. When you move your foot off the brake, the engine seamlessly powers back up again to get you moving. If you’re excited to give this SUV a try, come to Oklahoma City Volkswagen. We’ll show you around the features it brings to the Edmond, Norman, and Oklahoma City areas before getting you behind the wheel to do a 2018 Volkswagen Atlas review of your own.